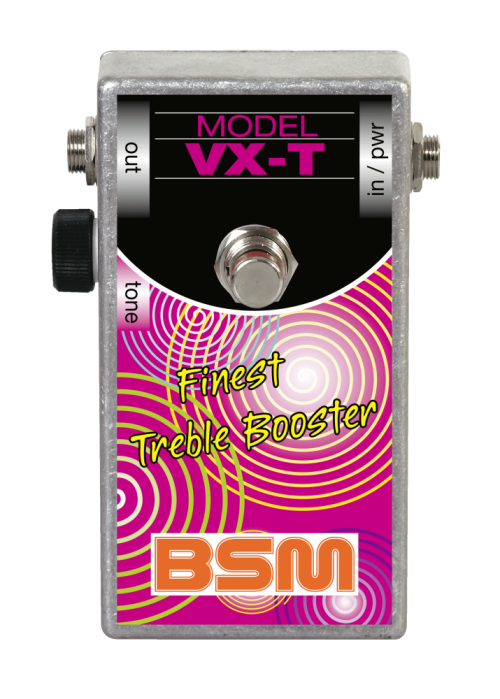 The BSM VX-T model is based on the british Vox Treble & Bass booster, made in the late 60's and used by many british bands at this time. Here is an almost identical copy of the second issue of this Vox unit, but with increased gain and a slightly modified tone network, pronouncing the mid frequencies and making the VX-T the perfect treble-midrange booster. So the sound of the VX-T is placed in between the VX-C Classic Treble&Bass booster and the RMG Treble Booster. The VX-C Classic offers a more vintage orientaded tone control with some good low end, while the RMG adds more twang and spank to the tone. The VX-T model includes a tone control which allows an extraordinary amount of versatility. When setting the tone-pot to maximum, the unit will produce a very glassy tone - like the "jinge jangle" sound of Roger McGuinn during his mid 60s time with the BYRDS, but with more gain than the RMG and VX-C. When a middle setting is dialed in, the result is a punchy tone with mild highs and a tight an powerful bass bottom. If set to minimum, the unit produces a bluesy bottom with enough mids and a little bit of shimmering highs, but the bass is never getting wooly, like the VX-C Classic can do. Almost all British rock guitarists using single coil pickup guitars used some type of germanium booster from the late 60's to the mid 70's. By the end of the seventies, these boosters were replaced by a new circuit from Japan, the so called Tube Screamer and other similar overdrive circuits. These were based on the old boosters and therefore had a very similar frequency response. The germanium boosters on the other hand, sadly fell into oblivion despite their unique and inimitable sound. The VX-T Booster is 100% true bypass and inserted between the guitar and the amplifier, not into the FX loop. The magical tone is achieved by the interaction between guitar pickup, booster and amplifier. The unit is powered by a single 9V battery with a current consumption of aprox. 35 mA. The average output level is 3dBm, the maximum output voltage when the strings are struck really hard is 3V max. For even more clean headroon, you can also power the unit with 18V. Note: The negative pole of the battery is ground. If you have any questions concerning our products, especially the BSM VX-T Treble/Mid Boost, our tech-head and mastermind Mr. Bernd C. Meiser would be happy to talk to you. So don't hestitate any longer and send him an email to info@treblebooster.net or use the contact form to contact him.